Canopy Stairs are a cool idea I ran across in a tweet from the Hager Group. 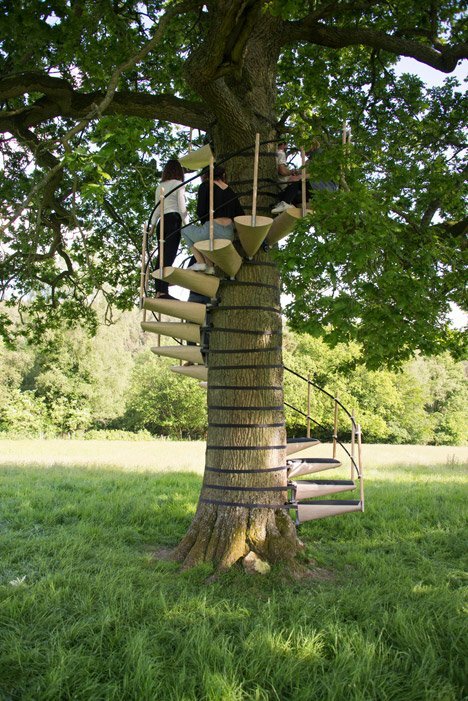 Designed by a pair of graduates of the Royal College of Art, the stairs create a spiral stair case around the trunk of a living tree without harming the tree. While the whole system was worked out with consultation with arboriculturists to assure there would be no detrimental effects on the trees, there sure is a lot of backlash from the tree huggers in the comment section at the bottom of the article. What they seem to be missing is that this is designed to be a temporary, reusable system. The system is designed to distribute the loading around the trunk and would appear to minimize any damage to the tree. As a Landscape Architect, I would suggest this is good stewardship. It enhances the highest, best use of a natural resource with minimal or no damage. Find more pictures and the complete article here. Are you marketing these Canopy Stairs for sale? Great idea, I’d buy a set for a tree house. Please contact me as to cost & where I may purchase them. They are pretty cool, aren’t they? I am not selling them and I’m not sure if they are being mass marketed at this point. There is a contact page on the designers’ website here: http://www.canopystair.com/ Let me know what you find out. I am going to contact them as well to see if they are in production yet.